Background: after experiencing numerous problems with my previous car, a relatively low miles ‘10 mini cooper s, I decided I had had enough, and began shopping for a used car. I was already looking at focuses (focusi?) As my experiences really turned me off of non-porsche german cars, leaving only the focus and the veloster. I live with my parents still, allowing a more substantial payment. Even though I should be getting a job soon, between debt and everything I would rather go inexpensive to leave room for future hoopties. Finally, I read an article on the FP that mentioned Ford’s factory discounts on cars such as the ST. This meant I could get a new car for the same as nice used examples just a month earlier. This sealed the deal. The buy: dealer was ok. Some finangling was required to maximize my discounts, but the salesman was extremely cooperative given I was getting the car for basically cost. The trade in I got for the mini was abysmal, but the hood release had broken for the second time literally the day I went to get it appraised. Wow. Did I mention I now hate that car? The Focus was traded from another dealership, as my dealer didn’t have any. No test drive but I didn’t care. This is when the problems really began, as the other dealer didn’t remove the brake rotor shipping protectors before they drove it to mine. Yikes. Also, my car didn’t have a trunk liner, which I didn’t realize until I got home. I did look the car over before I took delivery, but I didn’t think to look back there. The dealer understood, and gave me a liner from another car on the lot. It had a cutout for the subwoofer mine didn’t have. This matters because when I got the one that was supposed to be from my car... it also had the cutout. Which means the other dealer pulled one from another car. Whatever, there are bigger problems in life. 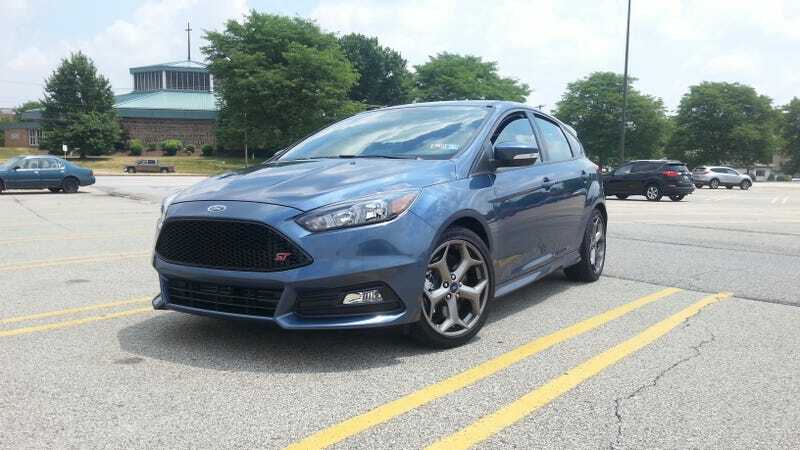 I ended up with an essentially option-less Focus ST new with a six year extended warranty for the same price as a used, low mileage loaded car. I got it (not including trade in) for 22,195, (this including a six year extended warranty) off an MSRP of 26,045. although, this deal is similar to what is now advertised on their website, it wasn’t at the time. The car: fantastic. I bought a no-options car, and it has basically eveything I need. The real quibble I have is that interior materials vary wildly. The seats are nice for cloth, the window switches and steering wheel are fantastic. The center console is made out of some cheap plastic that scratches with a fingernail. The shift knob also feels cheap. Base stereo is fine, I’m no audiophile. Mostly I love sync and usb compatibility. Seats are comfy, and the car is reasonably roomy. Visibility is ok, but the a pillars are huge. Pedal feel isn’t as nice as the mini, but decent. Shifter similarly so, it doesn’t really make an impression other than the cheap knob. Most of all, I love the massive flat and raked windshield. Reminds me of an 80's wedge car when I drive it, really enhances the experience for me as odd as that sounds. The drive: I’m in love. Not insanely fast by any means, but it just pulls so hard in second gear. Fantastic, but pedestrian feeling until you wind it up. Power comes on early, but the rev range is so huge that by the time it gets going you are already going sixty in third. Cornering is dead flat. The car feels like a spaceship compared to the crap I’m used to. Brakes are likewise fantastic. Combined with the reasonable ride and this car beats the piss out of the mini, which felt like a very zippy bus riding on a rock hard suspension. I don’t like the 18 inch rims for a daily, I’ve scratched them already (although I’m used to them now). Mostly they don’t allow for sloppy parallel parking at all. Of special note, I’m only getting 18.5 mpg in suburb traffic, compared to the EPA 22 city. Dear god, I hope this is break in, as the gas tank is frustratingly tiny. As of writing the car has about 1,500 miles on it. Also of note: I do like the sound symposer. Given that it isn’t a speaker, and rather the engine noise ducted into the cabin, it gets a pass. Makes the car sound reasonably meaty considering I am definitely not going to make the mistake of putting an exhaust on it. If it was a speaker I would have removed it. The car also has a legit spare instead of making me use runflats. Next on the list: winter tires and mats. Total Score: 8/10. That would increase to 9/10 should the fuel economy improve. Needs a bigger gas tank and a nicer dashboard. I would also like leatherette seats honestly instead of cloth or real leather.